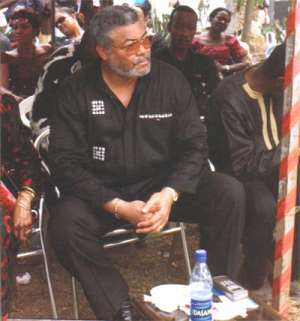 Ex-president Jerry Rawlings has denied that he is materialistic. He made this revelation in an extensive and exclusive interview with a Nigerian – based international magazine, OVATION INTERNATIONAL. In the interview he was asked why his children schooled abroad if he said he was not materialistic and loved Ghana. In his response to this question, he emphasized that although Ghana has some of the finest schools and universities, he had to send his children to schools abroad because the papers and the 'Rawlings bashers' were not ready to stop. According to him, sending his children to schools outside Ghana is not something he takes pride in or something his children takes pride because like him, they love Ghana. He had to take them to schools abroad because they could not cope with the pressure from the media and nearly developed a complex. And although they did not have enough money to see them through school, they had enough friends who could help. Eventually when some of them gave up, they had to go scourging for funds. The ex-President, however, stated that he is treated very well when he travels outside Ghana and will not call those presidential privileges. When asked what the criterion was for the killings during the revolution, he explained that the revolution was a reaction to the accumulation of things that happened over the years. On the issue of seizing properties, he said his revolution was not the first to do that. He stated examples of other military régimes, like the one that overthrew the Nkrumah regime doing the same thing. He said the sufferings were too much they had to be stopped by either a coup d'etat or election. The executions he said were inevitable but the tried to stem the situation. According to him, he came to find the trees that used to fence his house at Ridge, cut down. He had raised the walls to prevent intruders from prying into their private affairs. He says, “ The idea is what you may call a siege mentally. You know if they come and harass me to be quiet, it will send the signal to the populace that if this great hero, this revolutionary can be silenced, then who are you? It is meant to intimidate, but I will not be intimidated.